The shape of the cross section of a stream channel is a function of the interaction between discharge and sediment, the erodibility of its bed and banks, the stabilizing influence of vegetation, and any large structure (boulders, large wood [LW]) that can influence local channel conditions. A cross-sectional survey maps the shape of the channel and measures depth at multiple points, effectively creating a series of cells of known width and depth, whose product is summed to determine the area (Figure 2.7). Mean depth can then be estimated as area divided by width. The location of maximum depth within the channel is known as the thalweg. Channel shape and cross-sectional area will differ from transect to transect even within a reach, as some locations are wide and shallow, others narrow and deep. Water discharge must be the same at each transect, barring tributary inputs and groundwater exchange, but area and shape need not. Channel cross sections are more regular, often trapezoidal, in straight stretches but are asymmetric at curves or bends, where the greatest depth and velocity usually are at the outer bank (Figure 31). Sediment deposition forms point bars along the inner bank due to reduced velocity and the helicoidal flow within the bend, in which near-bed current flows from the outside toward the inside of the bend. Anglers make use of these shallow and gently sloping regions of streambed to cast toward the deeper water on the far bank. In steep, narrow valleys, channels are confined by topography, whereas flat, wide valleys allow more lateral movement and meandering (Figure 3 2). 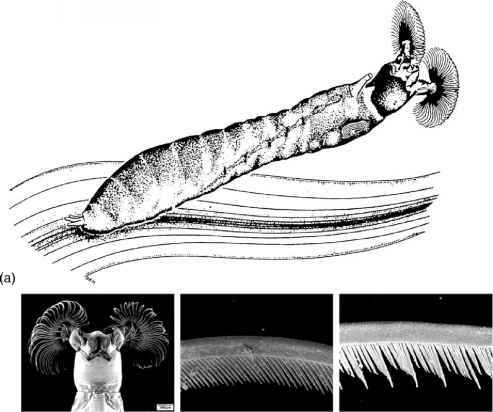 sions of the wetted channel are of obvious importance to the aquatic biota and change frequently with fluctuations in discharge, whereas the bankfull dimensions are of particular importance in interpreting fluvial processes. Rivers generally increase in size as one proceeds downstream, because tributaries and groundwa-ter add to the flow. Since discharge Q = wdv (see Equation 2.3), any increase in discharge must result in an increase in width, depth, velocity, or some combination of these. Figure 3 3 illustrates these relationships for the Powder River and its tributaries in Wyoming and Montana. A similar graph can be constructed from the fluctuations in river discharge over time at a single station. Hydraulic geometry, as defined by Leopold and Maddock (1953), describes the relationships among hydraulic characteristics, chiefly width, depth, velocity, and discharge. Power equations provide good fits to empirical data. Because Q = w x d x v, it follows that a x c x k = 1 and b + f + m = 1.
another set of coefficients held "at-a-station." This turns out to be an overgeneralization because coefficients vary with the nature of the material forming the channel perimeter, as Osterkamp et al. (1983) showed using data from the western United States. Bearing in mind that Equations 31-3 3 describe general trends, and there is considerable variation in these regressions (less apparent in the figures because of the logarithmic scale), some broad generalizations can be made. At a station, increases in Q are the result of a rain event and are accommodated mostly by increases in d and v until the river overflows its bank (if there is a floodplain), and then width increases greatly. As one proceeds downstream for a given flow stage, increases in Q are the result of tributary and groundwater inputs. 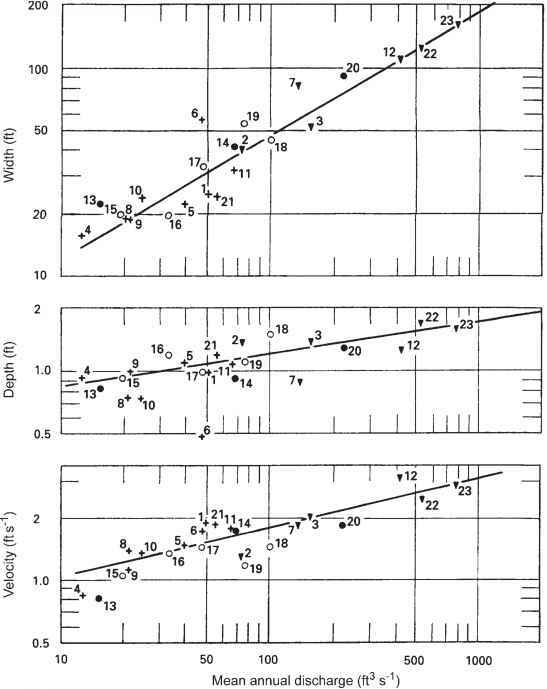 Width, depth, and velocity all increase log-linearly with mean annual discharge. The increase of width with discharge is greater than the increase of depth, while velocity increases least with discharge and can remain almost constant (Leopold 1962). The modest downstream increase in velocity may seem surprising, because we might expect velocity to decrease downstream due to a general decline in gradient. However, because channel depth generally is greater and substrates are finer as one proceeds downstream, resistance decreases longitudinally and this offsets the effects of reduction in slope. The River Tweed in Scotland illustrates this nicely (Ledger 1981). At most flows, the highest velocities are found at the lower and flatter end of the river system. Only in some situations, involving floods, does mean velocity not exhibit an increase in the downstream direction. Many variables affect degree of sinuosity, and so values range from near one in simple, well-defined channels to four in highly meandering channels. Meandering usually is defined as an arbitrarily extreme level of sinuosity, typically >1.5 (Gordon et al. 2004). 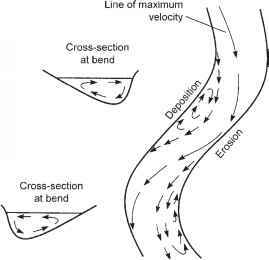 Flow through a meander stretch follows a predictable pattern and causes regular regions of erosion and deposition, as described above (Figure 31). A superelevation of water at the outside of a bend causes a helical flow of water toward the opposite bank. In addition, a separation of surface flow causes a back eddy. The result is zones of erosion and deposition, and explains why the features known as point bars develop in a downstream direction in depositional zones. The consistency of channel bends is such that if one scales a small stream and a large river to fit on the same page, their similarity is striking. Small channels wind in small curves and large channels wind in large curves (Leopold 1994). 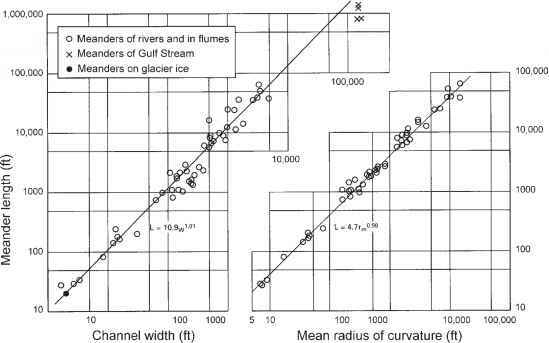 The wavelength of a meander averages about 10-14 times the channel width, whether one measures a stream in a small experimental flume or the Gulf Stream meandering in the Atlantic Ocean (Figure 3.4). The radius of curvature of the channel bend averages 2-3 times the channel width. Models of channel meandering have reasonable predictive ability but are still under development (Darby and van de Wiel 2003), and it is important to realize that most meanders are asymmetric (Carson and LaPointe 1983). 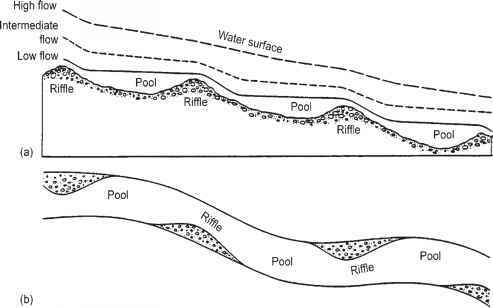 Pool-riffle channels typically are found in moderate to low gradient, unconfined, gravel-bed streams. At the scale of the stream reach, perhaps a few hundred meters in length, one can observe a more or less regular alternation between shallow areas of higher velocity and mixed gravel-cobble substrate, called riffles, and deeper areas of slower velocity and finer substrate, called pools (Figure 3.5). The riffle is a topographical hillock and the pool a depression in the undulating streambed. In self-formed pool-riffle channels, riffles are formed by the deposition of gravel bars in a characteristic alternation from one side of the channel to the other, at a distance of approximately 5-7 channel widths (Leopold et al. 1964). Pool-riffle sequences are the result of particle sorting and require a range of sediment sizes to develop. At low flows, riffles have a high slope, tend to be shallow relative to pools, and have higher velocities. At high flows the water surface slope becomes more uniform between riffles and pools, although pools remain deeper, and velocities increase more in pools than in riffles. This results in changes in the distribution of forces on the streambed. At flood stage, when flows are high enough to mobilize the bed, riffles are the locations of lowest transport capacity and thus the locations of gravel deposition. pool spacing (Figure 3.6). LW has its greatest influence on first through fourth-order streams, where it has been found to increase width, form waterfalls, and stabilize gravel bars, as well as create pools (Bilby and Bisson 1998). 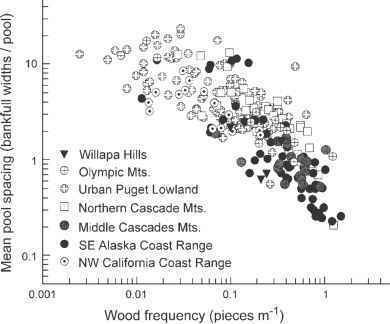 Physical diversity in sand-bed channels is often depressed in reaches where wood has been removed (Shields and Smith 1992). A floodplain is a level area near the stream channel that is inundated during moderate flow and is constructed by the river under present climatic conditions by deposition of sediments during overbank flooding (Leopold 1994). Unconfined, flat valleys, which occur most commonly in lowland rivers, permit considerable meandering and lateral migration, and so tend to have well developed floodplains. In contrast, in highly confined channels floodplain development is correspondingly restricted (Figure 3.2). Channel movement and valley flooding are regular and natural behaviors of the river. The bankfull level of a river can be recognized by field observations as described previously or by directly observing the flood where the river just overflows its banks. In practice, however, this is not always easily done. A widely used rule-of-thumb is for overbank flows to occur about every 1-2 years (the 1.5 year recurrence event in Figure 2.11), but actually the floodplain along a given stream reach may be inundated many times annually, or much less frequently. As a corollary to this statement, the river constructs a channel that is large enough to contain most discharges that it experiences; only less frequent, larger discharges spill out of the channel onto the floodplain. Owing to changes in climate or basin conditions, a river can change its bed level upward (aggradation) or downward (degradation). Over long periods of degradation, the old floodplain, abandoned as the river cuts downward, remains as a terrace.